Bridal Shower or Bachelorette Party Name Tags INCLUDES 12 Bride Squad name tag stickers with funny titles for all your guests. This fun bachelorette party accessory is exciting for everyone but still tame enough for modest crowds. 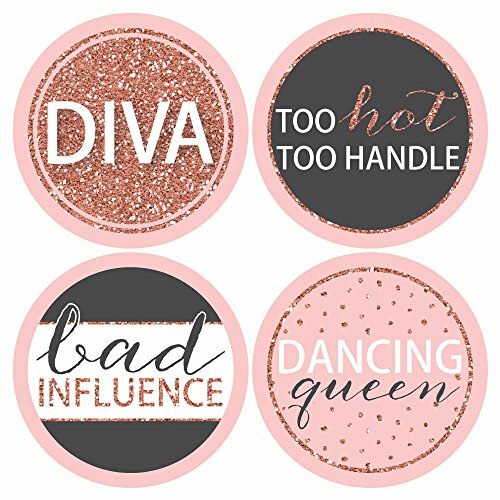 Set of 12 Bride Squad Bridal Shower or Bachelorette party badges each SIZE 4 inches diameter, a large size to perfectly highlight your chosen party name. 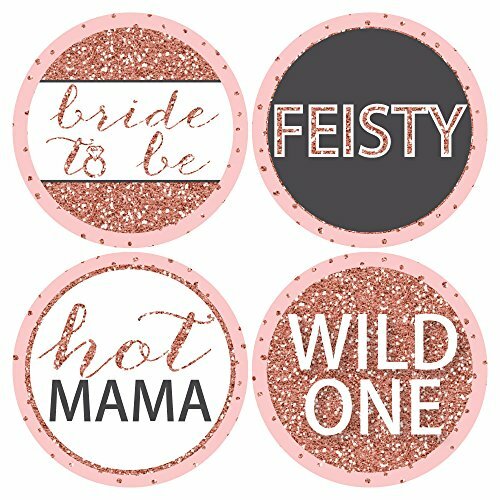 Party Badge Names: BRIDE TO BE, FEISTY, HOT MAMA, WILD ONE, MAID OF HONOR, MISS BEHAVING, LUSH, SINGLE LADY, DIVA, TOO HOT TOO HANDLE, BAD INFLUENCE, DANCING QUEEN. EASY TO USE: Simply remove your desired party name sticker from the backing and press firmly to clothing for the perfect photo op. 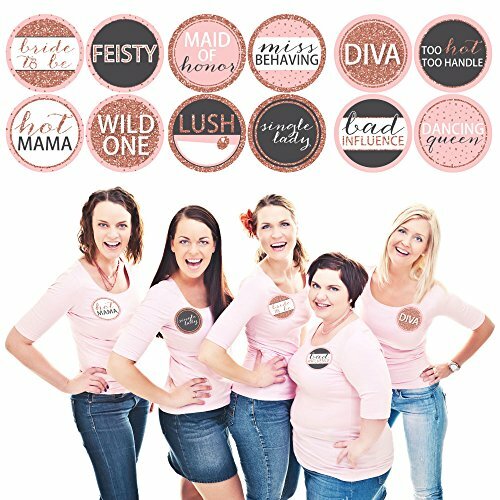 Funny Bride Squad name badges will give you photos that everyone will want to share! 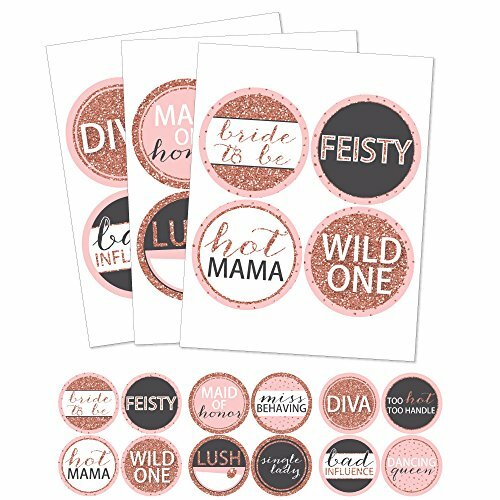 PREMIUM BRIDAL SHOWER OR BACHELORETTE PARTY SUPPLIES: This Bride Squad bridal shower or bachelorette party name tag sticker set is professionally printed on premium sticker paper with a photo-like shine. Each party badge set is inspected then carefully packaged by hand. 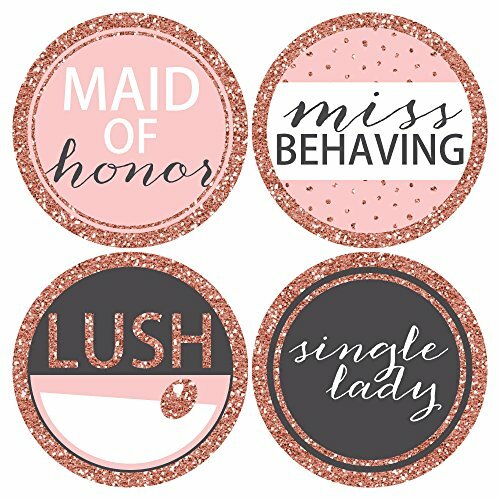 MADE IN THE USA: Bride Squad - Bridal Shower or Bachelorette Party Name Tags - Party Badges Sticker Set is designed and manufactured at our Wisconsin facility using materials that are Made in the USA. Party Badges use a No-Mess Glitter Print: Our name tag stickers are designed with a printed image of glitter, eliminating glitter flake while maximizing bling effect!